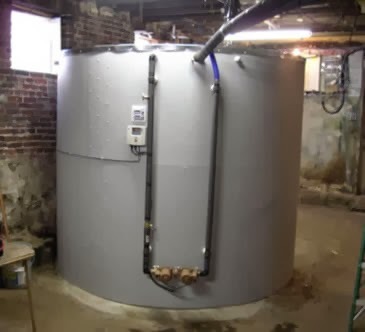 Alan Rushforth of Rushforth Solar provides detailed information on building large cylindrical water tanks for storing heat. These tanks are commonly used to store heat generated by an array of solar collectors in space and water heating applications. 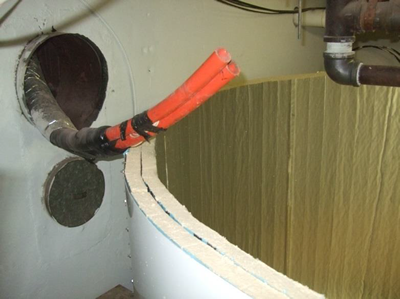 The tanks consist of aluminum sheet wrapped into a cylinder, which is then lined with rigid foam board insulation. The outer aluminum sheet wall with layers of insulation inside. 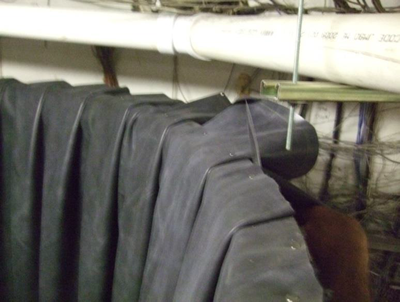 An EPDM liner is then installed to contain the water. 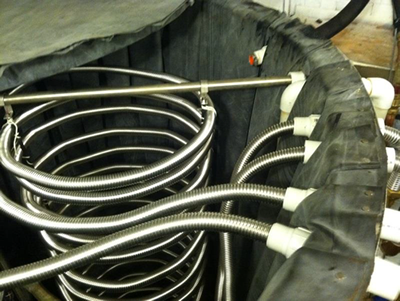 Stainless steel pipe coil heat exchanger. Although I salute you on your tank, I have had an EPDM tank before! It leaked as it aged. I am trying to build a high temp fiberglass tank liner. We don't put boiling water into these tanks, and high temp resin is good to just over boiling temps. How long did the tank last before you had a leak? Seems like most people get 10+ years out of them between linings. If you build an FG tank, please let us know how it comes out.